I was clicking through Pinterest for a few minutes at around 11am one day, came to a photo of a version of this, got up from my computer, went to my kitchen and did my best to recreate it. I was not disappointed! The flavours! Amazing! The colours Fabulous! 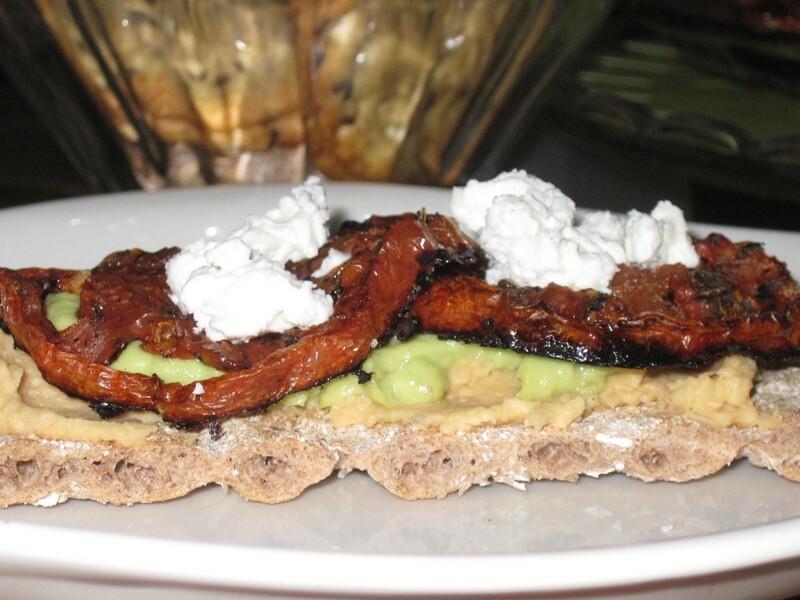 While the tomatoes were roasting I made up some hummus, prepped the avo and crumbled some feta. I didn’t have any bread on hand (a loaf in the breadmaker) so I used up some crackers we had left over from Christmas nibblings. Slice tomatoes, place on baking tray lightly sprayed with vegetable oil spray, drizzle with a bit of olive oil and balsamic vinegar. Sprinkle with salt, pepper and basil. Bake in preheated oven for about 25 – 30 minutes until the tomatoes start to caramelize. 1 (425gm) can Chick Peas, rinsed and well drained. In food processor combine chick peas, garlic, lemon juice, tahini, olive oil, salt and pepper; pulse a few times. 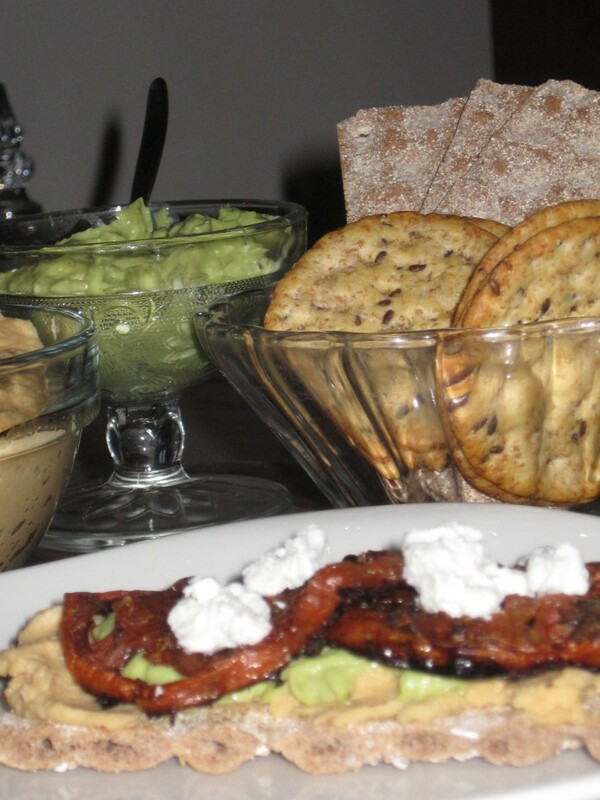 Scrape hummus into a bowl, sprinkle with a bit of paprika. Spoon avocado into food processor. Pulse a few times, scrape down sides, continue processing until smooth. Top with one or two slices of roasted tomato. My sister made these once, well, she probably makes them from time to time. I suppose I should say that she made them one time when I was visiting her and I loved them! I forgot to get her recipe which is a shame because I think I liked her version better. Or maybe, just maybe I should actually follow a recipe as stated and use measuring spoons? I googled Cajun Sweet Potatoes (at least I remembered what they were called!) and found this recipe. I was also making Perogy Casserole and was able to get two casserole dishes on my single oven rack! I thought the Cajun Sweet Potatoes were a nice side for the Perogy Casserole. Lightly spray a 9×13 casserole dish with vegetable oil spray. 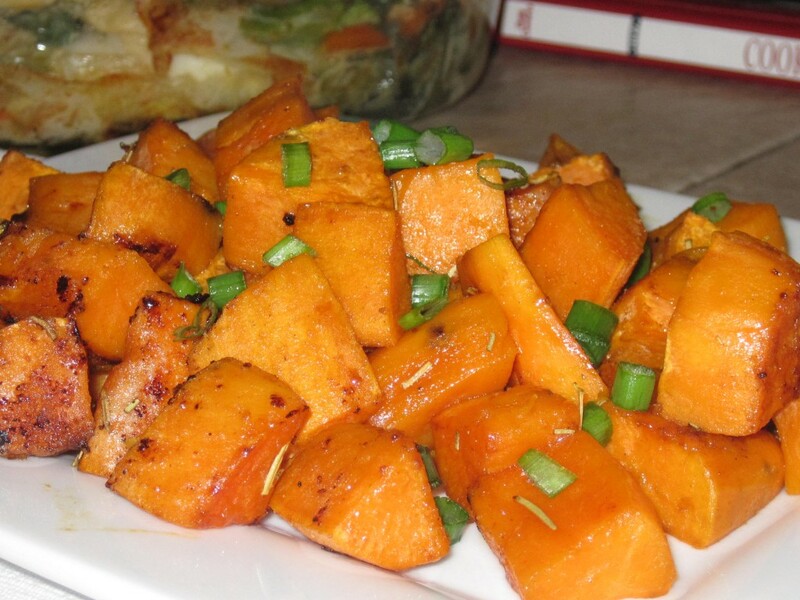 Peel sweet potatoes and cut into cubes; place in casserole dish. Sprinkle herbs and spices over sweet potato cubes: toss to coat all cubes. As mentioned above, I did not measure any of the herbs and spices; I just sprinkled away, straight out of the Tupperware containers. I will say I added heaps more cayenne than listed. I would also say that I used quite a bit more onion and garlic powder. 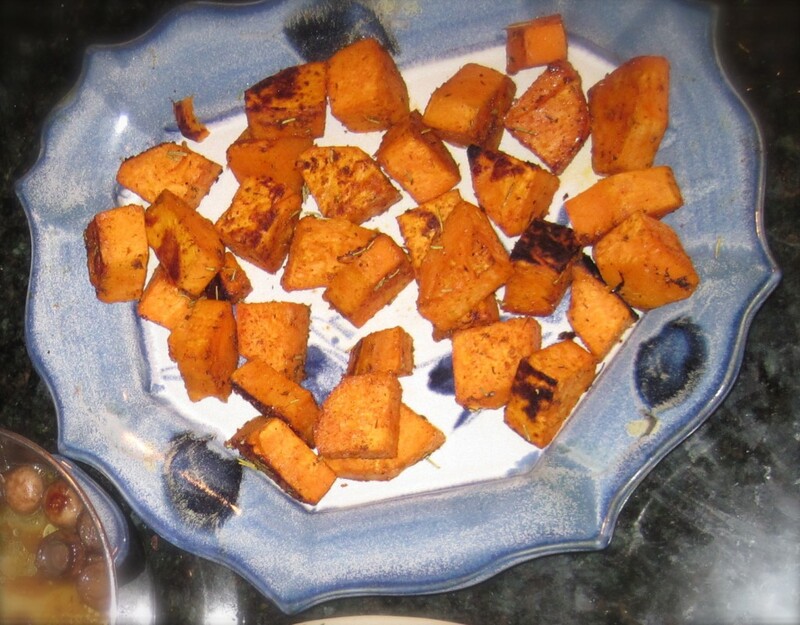 The Cajun Sweet Potatoes we made at my sisters over the past summer. 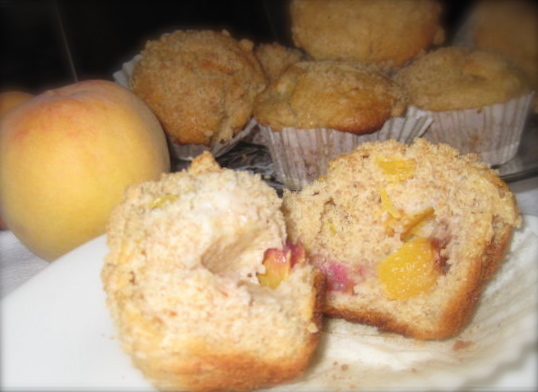 These are perfect to use up those Peaches and Nectarines that are beyond eye appeal for eating but still perfectly good! I often double my Muffin Recipe and make 20 to 21 larger muffins. Line muffin tin with paper liners; set aside. Combine brown sugar and flour together in small mixing bowl. Cut butter into cubes and toss into the flour mixture. * I make a large amount of Streusel Topping from time to time and keep it handily stored in a Tupperware Round #3 Modular Mate in the fridge. In large mixing bowl combine flour, baking powder, sugar, salt and cinnamon. Add prepared fruit and toss to coat with flour; make a well in the centre and set aside. In large pyrex measuring cup melt some butter, add enough oil to measure 1/2 cup; add milk (soy milk), vanilla and egg (egg replacer). Stir with fork to combine. Add liquid ingredients all at once to dry ingredients and stir just until moistened. Use a 5ounce Pampered Chef scoop to fill each prepared muffin cup. Top with a scant teaspoon of Streusel Topping. Bake in preheated 400F oven for 10 minutes, rotate pan(s) and bake for another 10 minutes or until golden brown and pick in centre comes out clean. Remove from oven and cool in pan(s) on wire rack for 10 minutes. Turn out and cool completely. Store in airtight container for 2 – 3 days. A Sunday morning favourite. 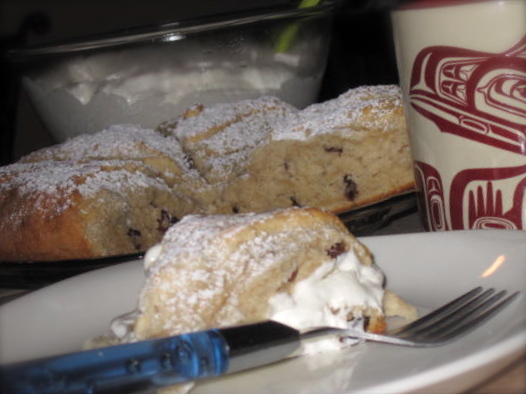 The scones are so basic and so good! I got this recipe from a Province newspaper many years ago. You know I have to switch it up from time to time! Sometimes I add White Chocolate Chunks and fresh Raspberries for a sweet delight! Often I will swap in Fresh or Frozen Blueberries. Sometimes I add cinnamon to the dry ingredients, give the scored dough an egg wash and sprinkle with a bit of Cinnamon and Sugar; you really have to watch these ones don’t brown too quickly! I have even cut back the sugar and made a Savoury Scone with grated Cheddar and Herbs. This is a great, versatile recipe. Sprinkle a little bit of cornmeal on a baking tray or a pizza pan; set aside. Combine flour, baking powder, baking soda and salt in a large mixing bowl. Turn out onto a well floured surface and gently knead for about a minute. Shape dough into a ball, cover with a clean tea towel and let sit for about 10 minutes. Pat down dough to form a circle, 3/4″ (2cm) thick and about 8″ (20cm) in diameter; transfer to prepared baking tray. Score round into 6 – 8 wedges, gently with a knife. Bake in hot oven for 20 – 25 minutes or until golden brown and set in centre. Cover with foil if becoming brown to quickly. *If you don’t have Buttermilk, sour the milk with 1 Tablespoon Lemon Juice or Vinegar – Measure Acidic ingredient into a measuring cup, add milk to 1 cup measure, let stand for 10 minutes. Sometimes I will prep the milk the night before if I plan on making these on a weekend morning. Reuben sandwiches are a memorable experience and you either love them, or hate them. 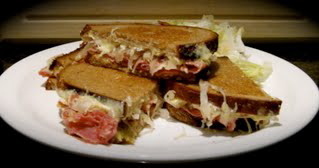 I must have loved them because I have been a vegetarian for 30 years and the memory of a reuben sandwich still sets my mouth watering! Set large 2 large skillets on to heat. Throw drained sauerkraut into one skillet and heat through; turn heat off, leaving sauerkraut in warm pan. Throw corned beef into the other skillet and heat through; transfer to heatproof bowl. Spread thousand island dressing or dijon mustard over 6 slices of bread. Place a slice of swiss cheese on each of the dressed slices of bread. Top with warmed corned beef and warmed sauerkraut. Spread the top slice of rye bread with a bit of butter or margarine. Place sandwiches, buttered side down in skillet, spread butter or margarine over top slices of bread. Grill over low-medium heat until bottoms are golden brown. Turn and cook until bottoms are golden brown and cheese is melted. If cooking a large quantity, transfer cooked sandwiches to a wire rack on baking tray and place in warm oven.